Mustard oil, or sarson ka tel, is an oil that is commonly used in Indian cooking. The oil provides a pungent flavor, a unique texture, and a reddish brown color. Mustard oil is extracted from black, brown and white mustard seeds and provides heart-healthy benefits due to its balance of both poly- and monounsaturated fats. Mustard oil is also believed to provide benefits for the skin and hair. There are three different types of fat in mustard oil. There is a small amount of saturated fat in this oil. Saturated fats are considered to be less healthy fats as they may contribute to heart disease. 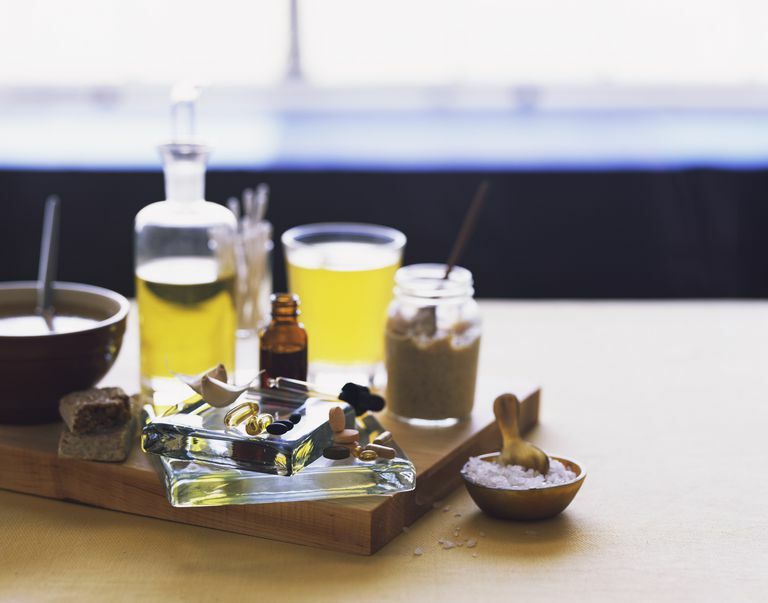 The American Heart Association recommends choosing oils with less than 4 grams of saturated fat per tablespoon. Mustard oil provides just under 2 grams of saturated fat per tablespoon or roughly 1 percent of your recommended daily intake. You'll also get 3 grams of polyunsaturated fat when you consume a tablespoon of mustard oil. Polyunsaturated fat is liquid at room temperature and may boost heart health when you use it to replace less healthy fat (like saturated fat) in your diet. Polyunsaturated fat is considered to be a "good" fat. Most of the fat in mustard oil is monounsaturated fat. Monounsaturated fats come primarily from plant sources, like avocado, nuts, or seeds. Monounsaturated fatty acids, also called MUFAs, are believed to increase your HDL cholesterol or "good" cholesterol. Health experts recommend that you replace less healthy fats (such as saturated fats and trans fats) with monounsaturated or polyunsaturated fat. The Academy of Nutrition and Dietetics recommends that 15 to 20 percent of your caloric intake come from monounsaturated fatty acids. Mustard seeds provide carbohydrate in the form of fiber and starch. But there are no carbohydrates in mustard oil. The estimated glycemic load of mustard oil is zero. Mustard seeds provide protein. But even though mustard oil comes from mustard seeds, there is no protein in mustard oil. Even though some health and beauty sources report that you'll get important micronutrients from the product, mustard oil provides no vitamins or minerals, according to USDA data. When you consume mustard oil, you increase your intake of omega-3 and omega-6 fatty acids, two types of polyunsaturated fat. Both omega-3 and omega-6 are essential fats, these are fats that must be consumed in the diet because your body does not produce them. The omega-3 fatty acids in mustard oil (12862 mg) help to reduce blood clotting and inflammation in the body and also may help dilate blood vessels and lower blood pressure. The omega-6 in mustard oil (33424 mg) helps to reduce your risk for heart disease and may also help to reduce your risk for cancer. The monounsaturated fat in mustard oil also provides health benefits. Research has shown that when you replace saturated fat with monounsaturated fat your risk for cardiovascular events or cardiovascular death is reduced. In addition, studies have found that an increased intake of monounsaturated fat reduces the risk for all-cause mortality and stroke. If you choose to include mustard oil in your diet it's important to remember that this oil, like all oil, is fat. Fats contribute 9 calories per gram as opposed to four calories per gram for carbohydrates and protein. So even though mustard oil is considered a healthy fat, you should still consume the oil in moderation in order to reach and maintain a healthy weight. Other than cooking, what are other uses of mustard oil? Mustard oil for skin. Mustard oil is often used as a massage oil for the body or the scalp. When you buy this oil, the bottle will usually state the oil is meant for external use only. To use the oil, simply pour a small amount into the palm of your hands and rub into skin. People who use mustard oil on skin say that it helps to reduce the look of fine lines and wrinkles, minimizes dark spots and even help to reduce acne. Fans of the oil also say that it helps to relieve muscle soreness when used during massage. Mustard oil for hair. People who use mustard oil on hair believe that it helps to reduce premature graying if you massage it into the scalp at night. Some say that it can even help to reduce hair loss or improve hair growth, although scientific evidence to support these beauty benefits is lacking. What is the best way to store mustard oil? Mustard oil should be kept in an airtight container and should be stored in a cool dry place, out of direct sunlight. Mustard oil has a higher flash point than other types of healthy oil such as canola oil or olive oil or even safflower oil. The flash point, or smoking point, is the temperature at which an oil begins to smoke fumes. Because the smoking point of mustard oil is approximately 480°F (or 250°C), it is often used for frying and other high heat cooking techniques. In addition to frying, mustard oil can also be used for sautés, in baked treats, meat glazes, and dressings. According to the Therapeutic Research Center Natural Medicine database, mustard oil applied topically may irritate the skin. Symptoms may include redness, itchiness, or irritation. Mustard allergies are not uncommon. If you have a mustard allergy, you are likely to experience symptoms if you consume mustard oil. Those symptoms may include a rash anywhere on the body or a tingling or itchy feeling in the mouth. More serious symptoms may include swelling in the face, throat and/or mouth, difficulty breathing, severe asthma, abdominal pain, nausea, and vomiting. If you suspect that you have an allergy to mustard or mustard oil, talk with your healthcare provider to get a proper diagnosis and tips for managing symptoms.